Leading fire and gas detection company, ProDetec introduces the new Simtronics MultiFlame DF-TV7 series flame detectors that are highly sensitive to fire and especially ideal for use in dirty environments. Designed to provide fast and accurate detection of hydrocarbon fires while ensuring reliable false alarm immunity, the new Simtronics flame detectors are available in multispectral IR (IR3) and UV/2IR versions with both models housed in a rugged 316 stainless steel enclosure, approved to ATEX, CE, and IECEx global standards, and certified and suitable for use in SIL2 applications. 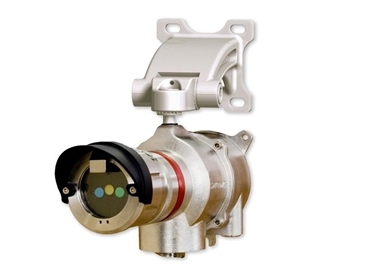 The Simtronics DF-TV7-V flame detector is based on a multi-infrared spectrum (IR3) technology that provides long distance-to-detection (80m for n-Heptane), is highly sensitive to fire and is ideal for use in dirty environments and for smoky fires. Using combined ultraviolet/infrared (UV-2IR) optical technology, the Simtronics DF-TV7-V flame detector provides industry-leading immunity to false alarms based on the two IR channel design. Both versions lead to very efficient false alarm rejection while maintaining optimum sensitivity to fire. Simtronics MultiFlame detectors can be configured to communicate with a wide range of fire panels, controllers, and PLCs, also offering HART 7 and Syntel (Lonworks) protocols for addressable event monitoring. The devices come standard with a configurable 4-20mA or 0-22mA (PLC) output, two configurable alarm relays, and two detector status LEDs. All Simtronics MultiFlame detectors are equipped with a continuous optical lens auto-check to ensure the optical path is clear and the detector functions properly. Sensors can be replaced easily in the field without removing any cable glands. Devices are easy to test and configure using a TLU wireless handheld unit approved for use in hazardous areas. The IECEx Hazardous Area Approved TLU can also be used for wireless testing of optical and output circuits. Through its association with Industrial Safety Technologies (IST), ProDetec provides innovative industrial safety solutions. Thanks to its partnerships with Simtronics and Detcon, ProDetec can supply comprehensive portable, wireless, and fixed flame and gas detection safety solutions.